For the fifth year in a row the Jumbos are headed to the third round of the NCAA women’s basketball championship in hopes of finally breaking through to the title game. After double-digit wins against Regis (Mass.) College on Friday and Moravian College on Saturday, No. 7 Tufts is headed back to the Sweet 16 where it will take on No. 9 Albright College. Tufts, whose toughest moment of the season came just over a week ago when it fell to Amherst by one point in the NESCAC championship, has kicked things off positively with two strong wins in the national spotlight. On Saturday night at the University of New England and after already having won their first round game on Friday night, the Jumbos took on the Moravian Greyhounds and dominated from the outset. By the end of the first quarter, Tufts had established a 21-7 lead led by junior Michela North. The NESCAC Co-Player of the Year dominated the floor with 14 points in the first period alone, shooting 6-of-7. From then on, the Greyhounds would get no closer than 11 points. A pair of three-pointers on consecutive possessions from sophomore Lauren Dillon and Wu pushed the Jumbos’ lead to 15 with just over two minutes to play before the end of the first half. Tufts went into halftime with a 13-point advantage. 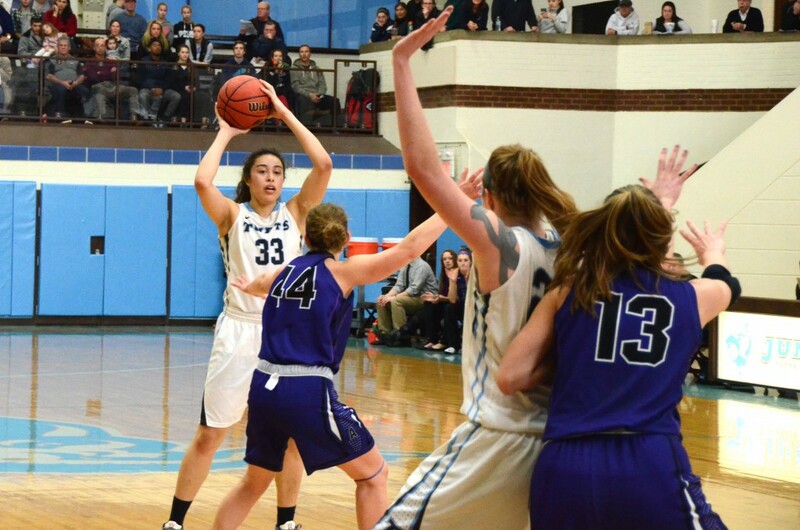 The second half saw Tufts establish commanding control, as North and sophomore Melissa Baptista scored seven points apiece in the third quarter. The Jumbos rode out a 51-29 lead after the end of the period and coasted to a 65-45 victory in the fourth to secure a spot in the Sweet 16. Though North — who has been on fire the last few weeks — once again led the team’s production with an impressive 23 points, two other Jumbos joined joined with double-digit point totals: Baptista and senior tri-captain Emma Roberson, who each scored 12. Dillon finished with eight assists and five steals. Moravian was led by 13 points from junior Camille McPherson. The most telling statistic was the 36-12 advantage Tufts had for points in the paint. Though North’s offensive production paved the way for comfortable wins on the weekend, the entire roster made important contributions to lock down victories in the competitive tournament setting. The night before, the Jumbos and the Regis Pride squared off in the first round. In the opening game, things did not go as smoothly on offense for the Jumbos, but in typical fashion, it was their defense that carried them to victory. Tufts shot just 29.2 percent from the floor, but it forced 25 turnovers on the defensive end compared to just 15 giveaways. Dillon led Tufts with 14 points and tacked on nine assists. Baptista and Roberson once again posted impressive scoring lines, putting up 11 and 10 points, respectively. Roberson also had six rebounds. For Regis, junior and New England Collegiate Conference Player-of-the-Year Amanda Hawkesworth led all scorers with 20 points and sophomore Brittany Stone finished with a double-double of 14 points and 14 rebounds. Though Tufts was out front for the entirety of the game, Regis got as close as six in the remaining two minutes. But the Jumbos converted 8-of-10 free throws in the final two minutes of regulation, including seven from Dillon and one from Roberson, to hold off the Pride. It was important for the Jumbos to establish their strong presence in the national tournament after the loss to the Purple and White of Amherst College in the evenly matched NESCAC championship. Though the Amherst game was a battle Tufts had nothing to be ashamed about, it was important for the Jumbos to refocus with some tough opponents on the horizon. The next test for the Jumbos will be in Scranton, Pa. this weekend. Tufts will take on Albright in one third round matchup, while host No. 3 University of Scranton will face off against No. 23 Christopher Newport University in the other. Albright is playing in its second NCAA tournament ever after winning the MAC Commonwealth conference championship this season. This is the Jumbos’ fifth straight Sweet 16 berth and they look to make it to the Final Four for the third year in a row. With everything on the line in the single elimination tournament, Tufts knows it has to come out firing all cylinders to keep the season — and national championship hopes — alive.